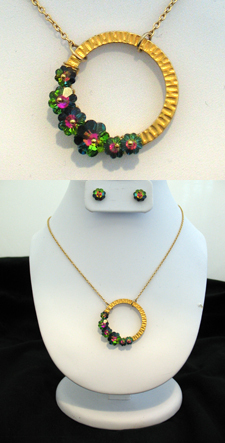 All that Glitters- New Give Away for the Holidays! 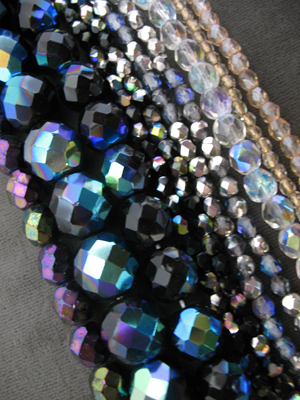 We at the Bead Bazaar like to keep tabs on evolving fashion trends, and with the holidays approaching, all that glitters seems to be first choice for party adornment. With this in mind, we’re excited to announce a new give away- for every $20 purchased at the Bead Bazaar, you get to pick a free strand of fire polished Czech glass beads. With their infinite color variety and high sparkle, fire polished glass provides a classy shine, perfect for any holiday piece. Colors range from silver to plum to champagne, and of course the classic black, and all sizes are applicable for the give away, from 3mm to 12mm. For a bit of fun and inspiration, we’ve assembled a few samples with the holidays in mind. Our pieces feature Swarovski Crystals, fire polished glass, Vintaj Brass, luxurious Czech Crystal, and a few natural elements as well. Since a party is your chance to shine, we’ve assembled a few true show stoppers. We also want to remind our crafty customers that Fairhaven will soon be hosting its annual gallery walk. 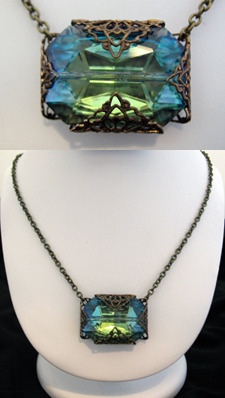 Friday November 26th and Saturday November 27th, the Bead Bazaar will join many shops in Fairhaven in showcasing the work of local artists. 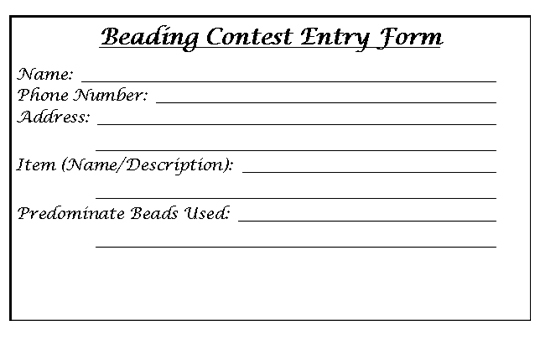 We participate by holding an annual beading contest and inviting passers by to vote for their favorite pieces. It’s still not too late to enter a piece, so feel free to drop off your hard work for the chance to win a $100 gift certificate! With the holidays in mind, this year’s contest has a theme: Fall to Winter Transitions of Color. Rules and prize information can be found here. Attached is a copy of our contest entry form, so you can just print, fill it out, and bring the form i with your entry! To print, click on the image below. A new window will open, and you can print the file from there. We would appreciate receiving any entries no later than Sunday, November 21st. Good luck, and happy beading! 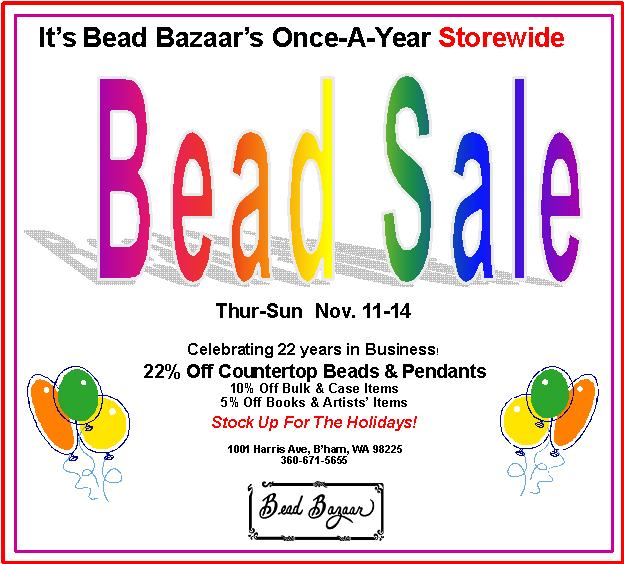 This year brings another happy birthday to the Bead Bazaar, so come celebrate our 22nd anniversary in style with a store-wide anniversary sale! Take a festive 22% off of all loose items, and 10% off bulk and case items. 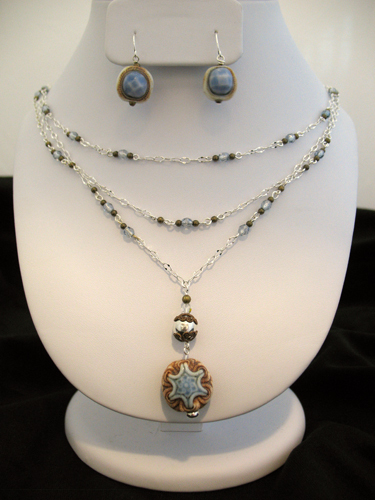 Books and artisan pieces are 5% off. Perfect for stocking up for the holidays, this sale only lasts from Thursday, November 11th through Sunday, November 14th, so be sure to stop by and indulge in your favorite beading goodies! Happy 22nd Birthday, Bead Bazaar!